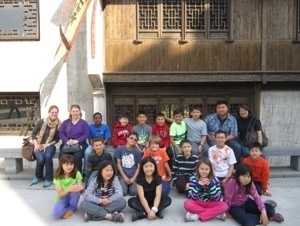 We met our guide, Becky, and the representative from our travel agency, Zhou, in Hangzhou. We got on the bus where breakfast from McDonald's as well as fruit, water, and milk was waiting for us. We were all happy to eat since we'd been eating pretzels on the train to tide us over before our arrival. Our bus took us to West Lake, and we went on a boat tour of the lake. It is very beautiful! 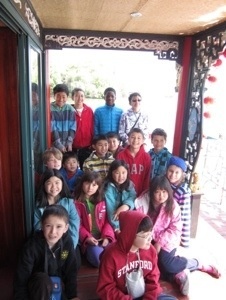 The children enjoyed seeing the pagoda of the White Snake Lady, whose story they had learned about in Chinese class. They were shocked to find out that Hangzhou has eight to nine million residents. The sun was shining and there was a calm breeze, a nice change from the tight quarters on the train. It was just the thing we needed to welcome us to Hangzhou and refresh us after our journey. We then went to the famous Hefangjie street where the children were given their first opportunity to spend some of their pocket money. We only had a short time there because of delays with our train and traffic. This was fortunate because the children might have spent all of their money in one spot if we had had longer. They bough different souvenirs and presents to bring home with them such as animals made of bamboo or metal, scarves, and more. They'll have a chance to do more souvenir shopping with their host families and in Shanghai. Afterwards, we took the bus to lunch near the tea plantations. It was extraordinary to see the many fields of tea with workers picking the leaves. We ate a very quick lunch in order to get to the theatre in time to see the Song Dynasty show. It was an exciting show! There was music, dancing, fight choreography, live horses, and special effects all depicting Chinese stories. The boys especially liked the fight choreography and wanted to reenact it afterwards, much to the chaperones dismay. We were all quite shocked at how the audience was not expected to sit quietly, people were allowed to take photos, and how large amounts of people began standing up and walking out during the last scene of the show. However, we were all very impressed at how our children used their best manners as members of the audience. Then came the moment everyone had been waiting for. We came to the Quishi school to meet our host families. There was a warm welcome and a short ceremony to introduce everyone before the children headed home for their first night with their host families.